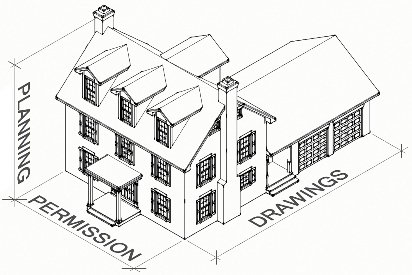 We provide Planning Permission Drawings and Plans in the Greater London Area. Our service is straightforward, friendly, fast, and most importantly – the price is fixed. Use the contact form below and we’ll get back to you. *Please see our testimonials at the bottom of this page. A simple side or rear Single Storey Extension which needs Planning Permission or a Lawful Development Certificate – £795. If your project requires Building Regulations drawings too, prices start at £995. A Loft Conversion which needs Planning Permission or a Lawful Development Certificate £895. If your project requires Building Regulations drawings too, prices start at £1095. A Conservatory which needs Planning Permission or a Lawful Development Certificate £495. If your project requires Building Regulations drawings too, prices start at £595. An Outbuilding which needs Planning Permission or a Lawful Development Certificate £495. 1. Measure and photograph your house. 2. Produce accurate ‘Existing’ Drawings. 3. Produce accurate ‘Proposed’ Drawings. 5. Talk to your Local Authority to discuss your proposals BEFORE submission of any Planning Applications. 6. Complete and submit your Planning Application to your Local Authority. 7. Liaise with your Local Authority to obtain approval for your Planning Application. 8. Complete and submit your Building Regulation application to your Local Authority or Approved Inspector. 9. Liaise with your Local Authority to gain Approval for your Building Regulations. 10. Make additional FREE alterations to drawings to obtain Local Authority approval. FREE PDF Files of the drawings for your project. FREE Hard copies of CAD drawings for your project. FREE hard copies of any correspondence received from your Local Authority. A simple Double (two) Storey Extension which needs Planning Permission £995. If your project requires Building Regulations drawings too, prices start at £1,195. A simple Garage Conversion which needs Planning Permission or a Lawful Development Certificate. If your project requires Building Regulations drawings too, prices start at £695. A Porch which needs Planning Permission or a Lawful Development Certificate £495. Various kinds of Internal Alterations £395. This type of requirement might suit clients who wish to open up their downstairs rooms. For example: Removal of an internal load bearing wall or a new ground floor toilet etc. Alteration prices start at £395. Great service, confident knowledgeable team, and we got exactly what we wanted from the planning drawings. Vigan was great too, he kept us informed of progress throughout, and was very nice when we wanted to make changes to the kitchen layout, because we couldn’t make up our minds! Great work Vigan and Alan. Fast service, and we were very happy with the results we achieved for our new rear extension. Vigan’s team were efficiency personified. Good advice provided, and the clear drawings helped us to understand what we were trying to achieve. Good communication from the gentleman who looked after our drawings. We are happy that finally we can have our family in the new big kitchen with us while we cook our Sunday lunches. I couldn’t be more pleased with the outcome from our first meeting and working with Alan and Tulay from PPD. They know what they are doing, and their advice for our loft was excellent. The work was completed very quickly too, 5 days from our first meeting to us receiving our drawings and specification. Now our neighbours opposite are going to use them too. Good luck for the future of your company, we wish you the best, and we think you’ll do very well.